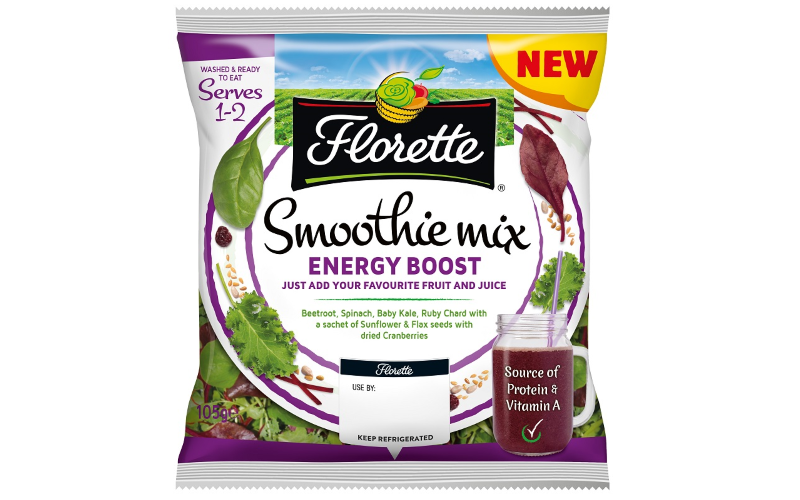 A freshly prepared bag of mixed salad leaves and vegetables come with a sachet of seeds and dried fruit, so all you have to do is add your favourite fresh fruit and juice and blend until smooth to make a deliciously, healthy smoothie. Ditch the complicated recipes and flavor combinations as Florette does all the hard work for you. Spinach, beetroot, carrot, ruby chard with a sachet of sunflower, pumpkin and hemp seeds with dried blueberries. Just add half a mango and 275ml of pomegranate juice and blend. Beetroot, spinach, baby kale, ruby chard with a sachet of sunflower and flax seeds and dried cranberries. Just add a handful of raspberries and 300ml of cranberry juice and blend.